Shoulder surgery is a treatment used for conditions ranging from shoulder arthritis to rotator cuff tears. Some surgical procedures are minimally invasive arthroscopic surgeries, and others are more traditional open surgeries with larger incisions. The success rate of many of these procedures is very high, however, there are possible complications of shoulder surgery, one of the most concerning being an infection. Most shoulder infections resulting from surgery are caused by bacteria that are normally found on the surface of your skin. These bacteria can get access to the deeper soft-tissues and joint spaces in the shoulder during surgery. If enough bacteria make their way into these deeper tissues, and your body's immune defense cannot manage the pathogens, then an infection may occur. 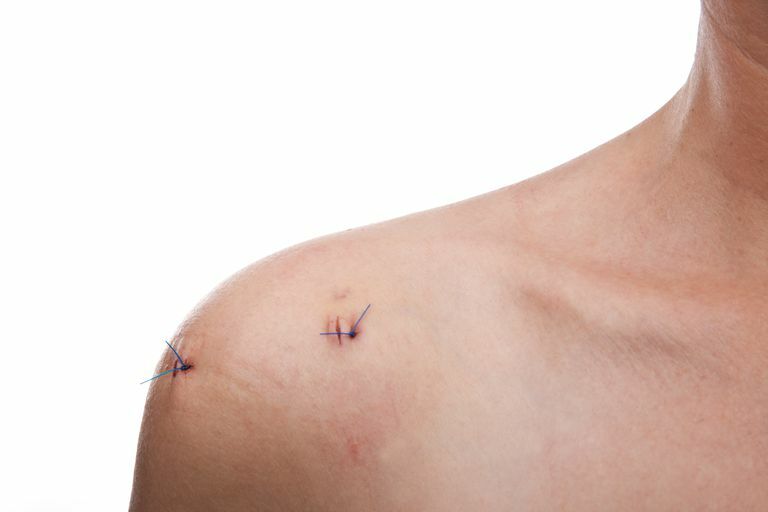 Shoulder infections are also challenging because surgical incisions are often located very near to the axilla (or armpit). The axilla is the location of many sebaceous glands and hair follicles that create an environment that fosters bacterial growth. There are some unusual bacteria, and many of them, very close to the location of your surgery. The best way to address infections after surgery is to focus on proven prevention measures to ensure this complication is as unlikely as possible. There are several steps that can be taken to ensure the prevention of shoulder infections. The first is to administer an intravenous antibiotic just before the surgical procedure is performed. This antibiotic should be given within one hour of the start of the actual surgery. Furthermore, the continuation of antibiotics after surgery is typically not necessary to prevent infection from occurring. Therefore, you don't need to take additional antibiotics after the surgery, just the one dose right before should be sufficient for almost all surgical procedures. Cleansing the surgical location is the other step proven to help prevent infection. The best surgical cleansing solution has been found to have a combination of alcohol with chlorhexidine. Some surgeons ask their patients to shower with special soap prior to coming to the hospital for their surgery, and while this hasn't been proven to be helpful, it is becoming more common. Many surgeons will remove armpit hair, although this actually hasn't been shown to make a significant difference in the likelihood of developing an infection. If armpit hair is removed, it should be done with clippers and not a razor, as the microabrasions caused by a razor have been shown to make the chance of infection higher! If you have these signs of infection, you should let your surgeon know right away. Early diagnosis of infection may help treatment progress much more easily. If an infection is suspected, your surgeon is likely to perform more tests, including blood tests to look for signs of infection. In addition, a fluid sample may be obtained to look for bacteria. If there is drainage from the incision, this fluid can be obtained from the wound. If the incision is sealed, a needle can be placed into the deeper layers of the shoulder to gain a sample of fluid for analysis. The most common types of bacteria that cause infection after shoulder surgery include Staph infections (both S. aureus and S. epidermidis) and Propionibacterium infections. This later infection, P. acnes, is unusual and typically associated with the shoulder joint, as opposed to Staph infections that occur all throughout the body. P. acnes infections are especially challenging because the infecting bacteria can be hard to detect in fluid analysis samples, and may require special testing procedures to detect. Once an infection has been diagnosed, there are a number of decisions that need to be made to determine the most appropriate treatment of the problem. Treatments may range from the administration of oral antibiotics to additional surgical procedures to clean the joint. In general, more superficial (closer to the skin) infections in healthier patients can be managed with antibiotics. Deeper infections, especially those that enter the joint space of the shoulder, are more likely to require additional surgery and prolonged intravenous antibiotics. Because the shoulder joint space has limited immune defenses, once the infection enters the ball-and-socket joint space, infections become challenging to treat without a surgical procedure. Infections that occur when surgical implants, such as a shoulder replacement implant or fracture plates, have been used are especially challenging. Surgical implants can be a place for infections to hide from the body's immune defenses, and these implants sometimes need to be removed for infections to be cured. This can be true of suture material, anchors used in repairs, and replacement implants. When an infection occurs in these situations, more aggressive treatment may be necessary. Shoulder infections are uncommon complications of shoulder surgery. However, because of the local environment of the axilla, these infections can occur. Prevention should be the goal of doctors and surgical patients alike, but when an infection does occur, early treatment is ideal. If you think an infection may be occurring in your shoulder, you should contact your surgeon right away and be sure you are receiving the most appropriate treatment for this condition. Saltzman MD, Marecek GS, Edwards SL, Kalainov DM. "Infection after shoulder surgery" J Am Acad Orthop Surg. 2011 Apr;19(4):208-18.